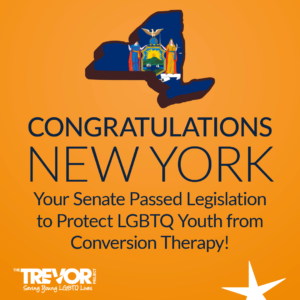 The Trevor Project celebrates two bills that passed the New York legislature today that will protect LGBTQ youth from the dangers of so-called “conversion therapy” and discrimination on the basis of gender identity and expression. Today the New York State Assembly and Senate both voted to protect minors from conversion therapy at the hands of licensed mental health professionals. When the bill is signed by Governor Andrew Cuomo, who has indicated his strong support, New York will be the 15th state in the nation to protect LGBTQ youth from this dangerous and discredited practice. The Trevor Project’s “50 Bills 50 States” campaign works to introduce legislation to protect LGBTQ youth from conversion therapy in every state in the country. People can sign up to join “50 Bills 50 States” by texting “TREVOR” to 40649. The New York State Assembly and Senate also both voted for Gender Expression Nondiscrimination Act (GENDA), ensuring the basic rights of transgender, gender nonconforming and nonbinary New Yorkers will be protected under state law. When Governor Andrew Cuomo signs the bill, the state will protect these groups from harassment and discrimination in employment, housing, and public spaces.